A while back I was looking at my bookshelf and thought it could make for an interesting post. After all, a person’s belongings can say so much about them so I jotted the idea down to return to later. Sitting down now to take it on, I figured it had most likely been done but a quick Google search has proven, as usual, that I am much, much less clever than I think. And yet, since essentially everything has already been written anyway (another clever observation I cannot claim to be my own), it is still worthwhile to do as the content of my bookshelves, at least, is particular to me and so here’s my contribution to the discussion. A Tumblr called Share Your Shelf which is dedicated to this precise topic and which invites you to do just as it says and share a picture/video of your bookshelves. “What Your Bookshelf Says About You To a Date” on The Date Report, which is pretty funny. Of course, there are those that will argue that simply owning a copy of Walden is in itself antithetical to his philosophy, but to those I say simply, find something more worthwhile to get upset about. One has to draw the line somewhere and rereading and carrying around Walden with me since high school has greatly helped me to simplify my life. I find it impossible to read without getting rid of possessions afterward. And so, for as much as I love books, and I truly do, I count only 30 on my shelf. Nine of those are nonfiction and consist of those I use regularly – health and philosophy – and those I hope to someday use regularly – European travel books. There’s also a bio of F. Scott Fitzgerald. Of the 21 fiction books, four were gifts and four I recently purchased at the library for a quarter each and intend to donate back once I read them. That leaves 12 that I have personally acquired that have found a permanent home on my shelf. This includes eight by Fitzgerald, two by Hemingway, James Joyce’s Ulysses, the work of World War I poet Edward Thomas, and Peter Pan. Take that for what you will. 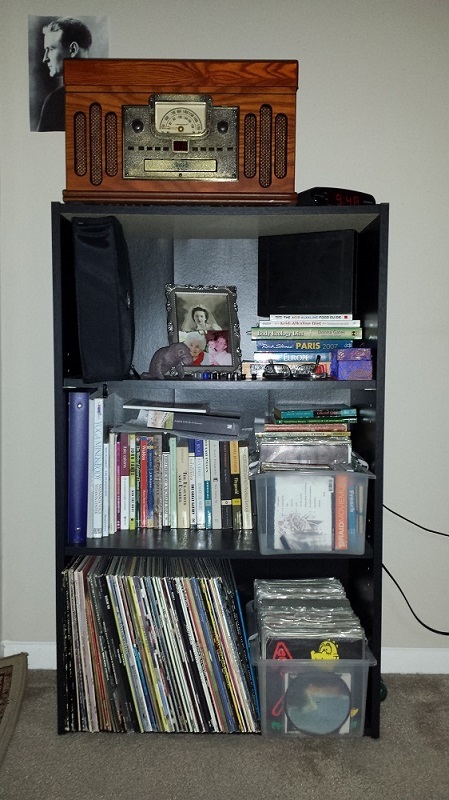 Half the bookshelf consists of record albums and 45s, 99 percent of which I got in high school. Additionally there is a handful of CDs still in cases (the ones that came in special packaging other than jewel cases), a book of cds, the manuscript and notes for my novel, a set of Chinese hand balls, my extra plugs (earrings), a manatee bobblehead my nephew gave me for Christmas, and photos of my deceased father and grandmothers. Oh, and my extra set of glasses. On top of the shelf sits a record/CD player (a gift) along with my alarm clock. And that’s it. I haven’t had a friend over to my place of residence since I left Chicago back in 2011 (well that’s a depressing thought) and so I don’t know if it is what they would expect or not. When I was traveling last year I always glanced at my friends’ bookshelves out of curiosity – often it was what I expected but occasionally there were some genuine surprises. What’s on your bookshelf? What do you think it says about you? 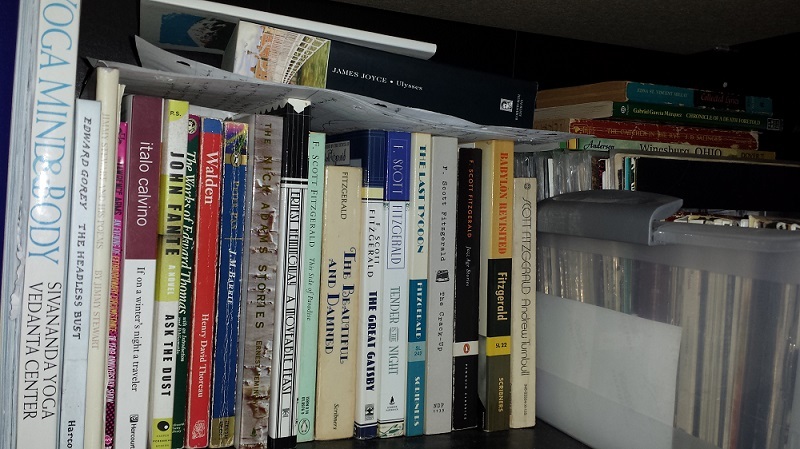 Would looking at your bookshelves give a stranger an accurate picture of you?